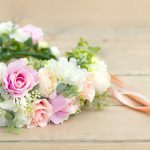 Inject some personal touches into your wedding with one of two easy-to-make ring bearer pillows, which you can easily show your florist for inspiration or follow the steps and DIY. This first wedding ring pillow has a woodland feel that suits a bohemian and vintage themed wedding. Prepare by cutting the florist wire with the Oasis wire cutter and bending into a u-shape and having a small ready-made flower arrangement. 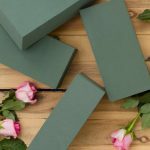 1/ Attach the full brick of foam to a 1/3 brick of the second foam and push down the u-shape florist wire to make a square; the base of the wedding ring pillow. 2/ Using the long blade knife, shave off each side, but this step is optional. 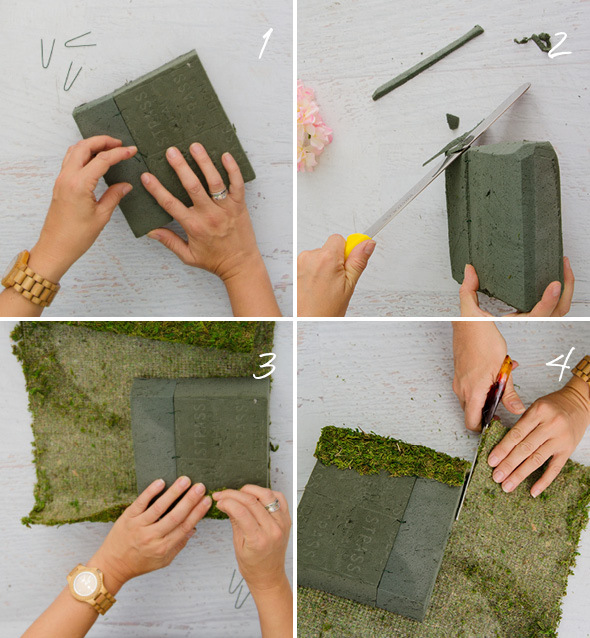 3/ Place the square shape floral foam on one edge of the moss mat. Fold a small side over the foam and pin down, as shown. 4/ Trim along the other edge of the moss mat. Keep this edge for later! 5/ Pin down the opposite side of the foam. 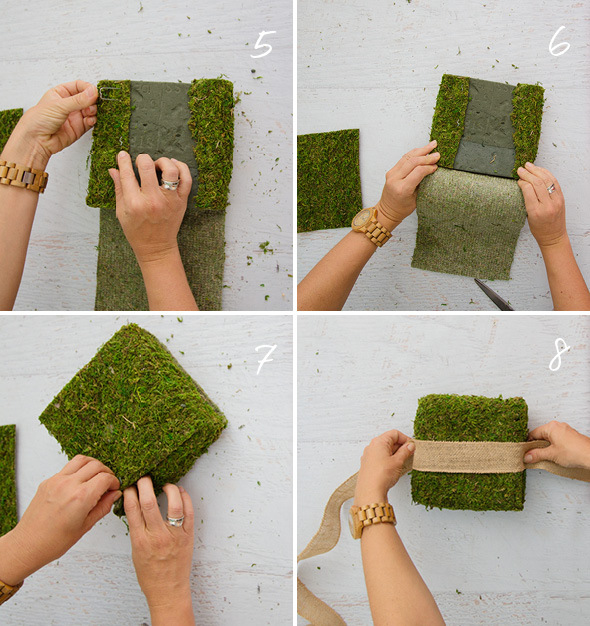 6/ Using the moss mat that was cut from step 4, fold over the remaining foam and pin. Continue to anchor each side of the moss matt down with the u-shape florist wire. 7/ Make sure no foam is exposed and pin the last corner securely. 8/ Now comes the ribbon part. 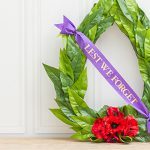 Wrap the jute ribbon around horizontally and vertically and tie a knot in place. 9/ Loop the white satin ribbon through the jute knot (not all around the pillow) and repeat the same technique for the lace ribbon. Cut the edges off the ribbon where it meets the edge of the ring pillow to keep it neat and tidy. 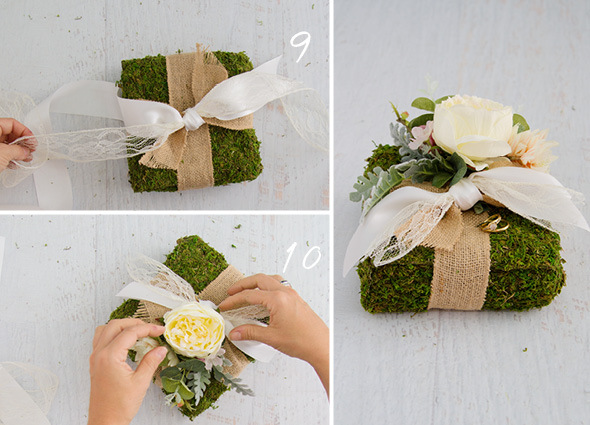 10/ Tuck your floral arrangement under the knot to complete. On the special day, have a spare u-shape florist wire to pin down the wedding bands to avoid the ring bearer losing the rings! Make a ring bearer pillow that looks lovely from all angles (great for photography) using silk flowers; be sure to choose a flower that has small petals and you’ll have a treasured keepsake on your hands. To prepare, gently take off the stock flowers from each stem and place them in a pile nearby. 3/ Next, poke a pearl head pin into the centre of each stock flower and push into the top, sides and bottom of the foam. 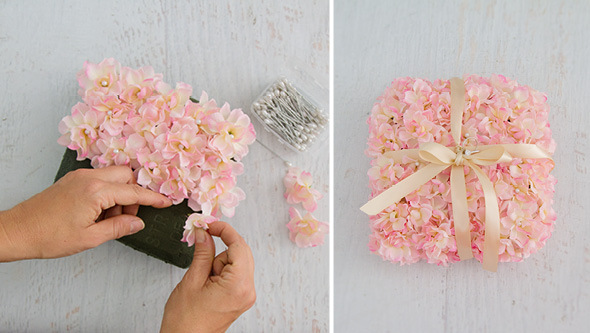 4/ Once covered with flowers, wrap the ribbon around the pillow and tie a knot. Next, thread the ends of the ribbon through the rings and finish off with a bow. It will be an amazing wedding gift. 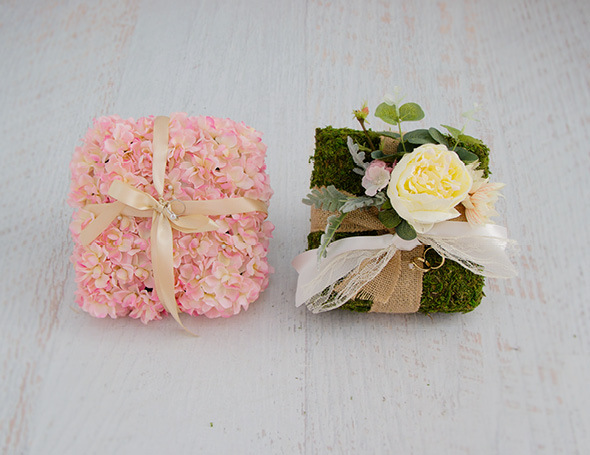 Maybe, I will not get enough time to follow all the procedures and make bulk Floral Wedding Ring Pillows. When I got married in a tropics, we used a coconut shell to put our wedding rings in! Never be afraid to put a personal touch to your wedding!